The importance of understanding the metabolism of agrochemicals in plants has never been greater. In a world where food safety and environmental concerns are increasing, knowledge of the metabolic processes within plants and the terminal residues of agrochemicals in food crops is invaluable. Written by experts in the agrochemical industry and academia, Metabolism of Agrochemicals in Plants is the first text to give systematic coverage of this important topic. This text brings together the current status of the subject with chapters on regulatory considerations, comparative metabolism of plants and animals, and the different phases of metabolism. Including new and novel research in primary metabolism, herbicide metabolism and bound residues, this work is unique and thoroughly up to date. This is an essential text for chemists and biochemists working in the agrochemical and pharmaceutical industries and academia as well as analytical chemists, regulatory chemists and environmental scientists. 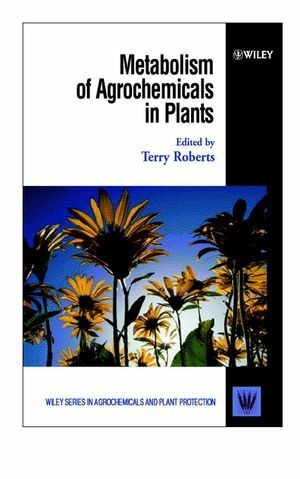 Metabolism of Agrochemicals in Plants is a volume in the Wiley Series in Agrochemicals and Plant Protection. This series brings together current scientific and regulatory knowledge and perspectives on all aspects of the use of chemicals and biotechnology in agriculture. Terry Roberts obtained his BSc in Chemistry and PhD at the University College of North Wales, Bangor. He then went to Case Western Reserve University in Cleveland, Ohio to do research in organic chemistry before taking a Research Associateship at the University of St Andrews. He joined Shell Research at Sittingbourne in 1969 to work on metabolism of pesticides in plants and soils, and subsequently took responsibility for metabolism, residues chemistry, environmental fate and ecotoxicology activities. In 1990 he joined Corning Hazleton Ltd and is currently Director of Agrochemical and Environmental Services. Terry Roberts is the author of many research papers and reviews on agrochemical environmental topics and of a book entitled Radiochromatography . He is a Fellow of the Society of Chemistry and Secretary to the Applied Chemistry Division of IUPAC. He has recently been appointed Editor-in-Chief of the new Wiley series on "Agrochemicals and Plant Protection". Introduction -- Regulatory Considerations (T. Roberts). Experimental Approaches for Plant Metabolism Studies (R. Baloch). Primary Metabolism of Agrochemicals in Plants (T. Katagi & N. Mikami). Secondary Metabolism of Agrochemicals in Plants (D. Cole & R. Edwards). Bound Residues Arising from the Use of Agrochemicals on Plants (M. Skidmore). The Comparative Metabolism of Agrochemicals in Plants and Mammals (S. Bounds & D. Hutson). Herbicide Metabolism as a Basis for Selectivity (W. Owen). Herbicide Safeners and Synergists (K. Hatzios).